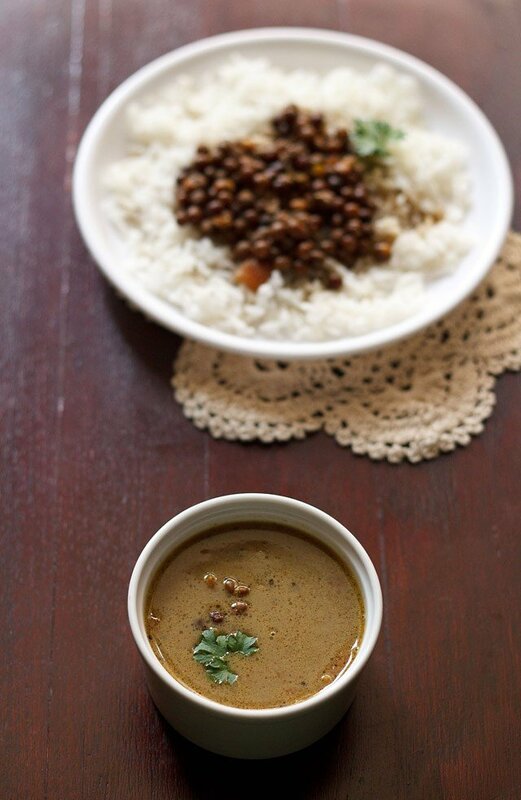 kala vatana amti is a no onion no garlic coconut based black peas curry. 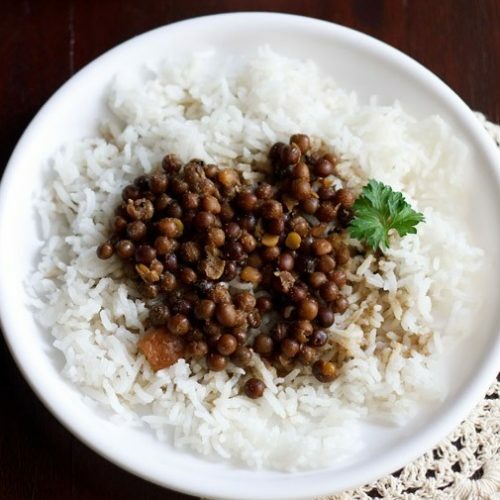 kala vatana amti or black peas curry recipe – on the occasion of ganesh chaturthi today i made a few dishes for naivedyam and this kala vatana amti is one of them. in marathi language its called as kalya vatanyche amti. 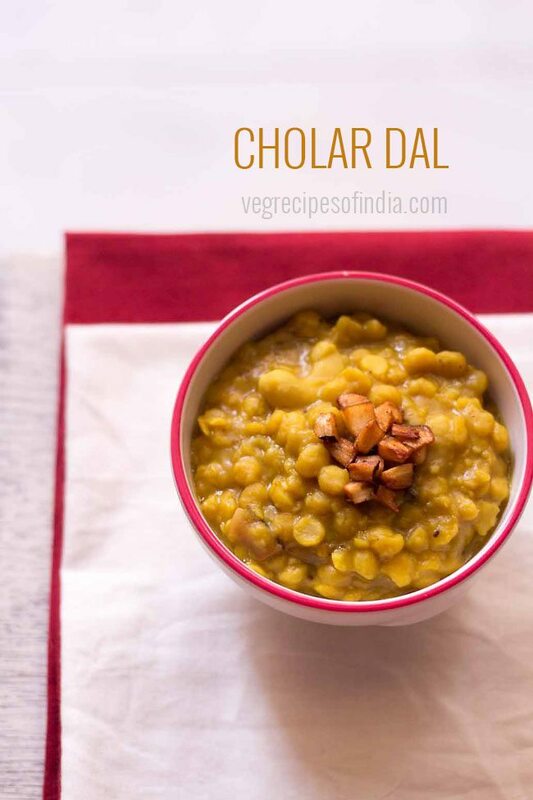 usually on the first day i make either a simple varan or kala vatana sambar, modak or sheera and a side salad. if time permits than i do make rice pooris or the regular wheat pooris too. this time i made a side carrot- cucumber salad, pomegranate raita, rava kesari and this black peas curry with steamed rice. this curry is made with black peas. these are different from black chickpeas or black gram. these are dried peas and they need to be soaked before hand for 8-9 hours before cooking them. below is a pic of these soaked black peas. they remain separate even when cooked and do not get mushy. best is to use a pressure cooker for cooking them. this time i did not make the kala vatana sambar. wanted to try something new. hence adapted the recipe from a cookbook. here basically three spices – cloves, pepper and coriander seeds are roasted with fresh coconut. the final curry has the aroma of the cloves. 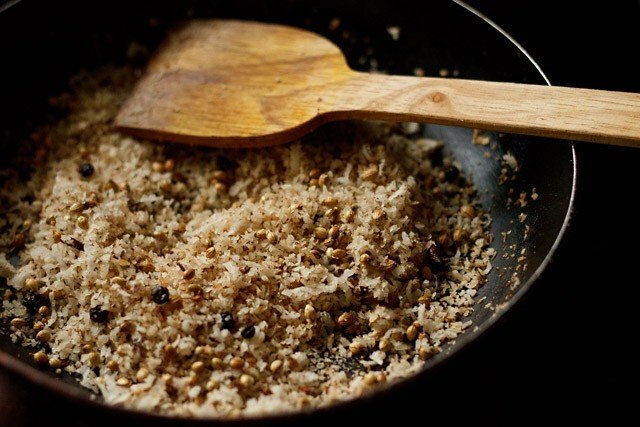 the roasted spice-coconut mixture is then ground to a fine paste. this kala vatana amti recipe is a no onion garlic recipe and hence is ideal for festive occasions like ganesh chaturthi. 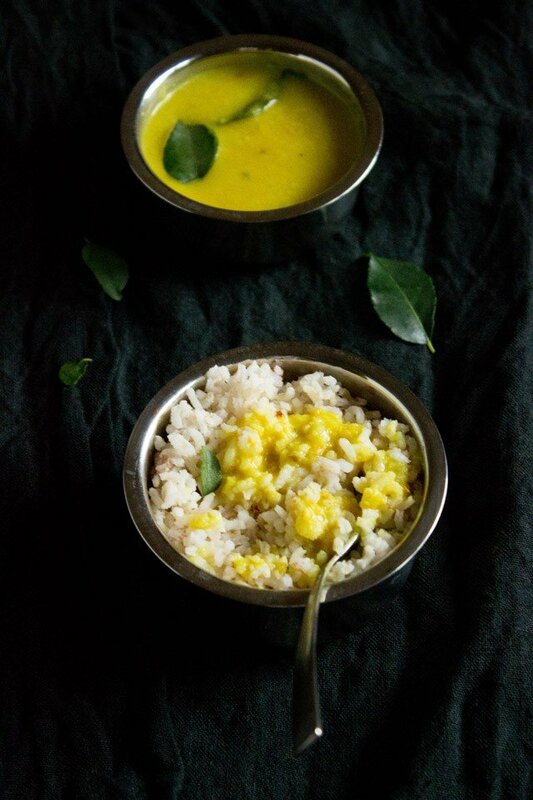 this kala vatana amti tastes best with rice pooris, bhakris, ambolis (a dosa variety) and steamed rice. they even taste great with pav (indian bread buns). rinse and soak the dry black peas overnight in enough water. pressure cook the peas till they are completely cooked. reserve two cups of the peas stock. fry the cloves, black pepper and coriander till they splutter and become aromatic. add the grated coconut and saute till the coconut gets browned. take care not to burn the coconut. keep on stirring while sauting the coconut to ensure even browning. let this mixture cool. add this mixture along with 1/2 tbsp of the cooked black peas in a grinder. 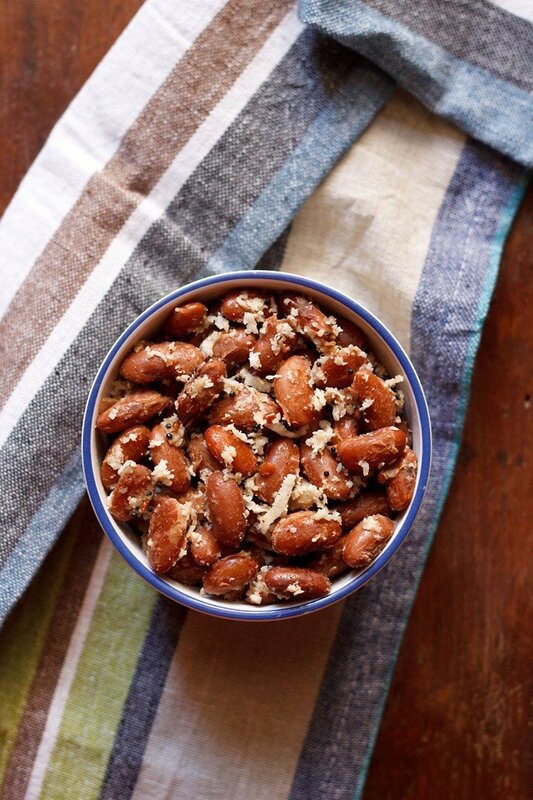 add 1/2 or 3/4 cup water and grind to a smooth paste. in the same pressure cooker or in another pan, mix the peas, the coconut paste, the 2 cups of reserved stock, chopped tomatoes, red chili powder, turmeric powder, garam masala powder, salt and keep to simmer on a medium to high flame. when the curry comes to a boil, then lower the flame and simmer for 15-18 minutes till all the flavors are well blended in the curry. if the kala vatana curry looks dry then you can add some water while simmering. now heat oil in a small frying pan. 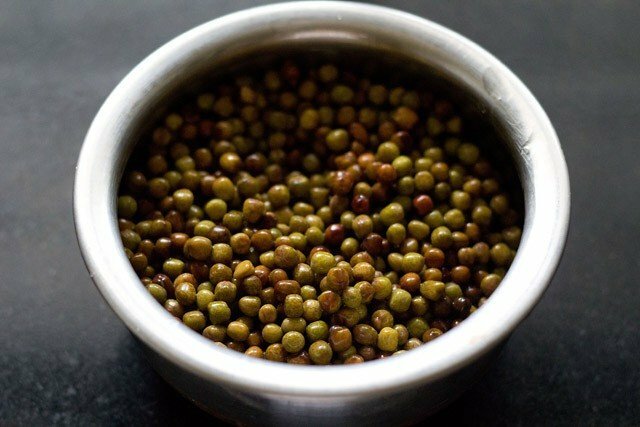 add the mustard seed and when they almost finish up making the popping sound, immediately pour the tempering in the curry. switch off the fire and cover the curry pan or pot with a lid. 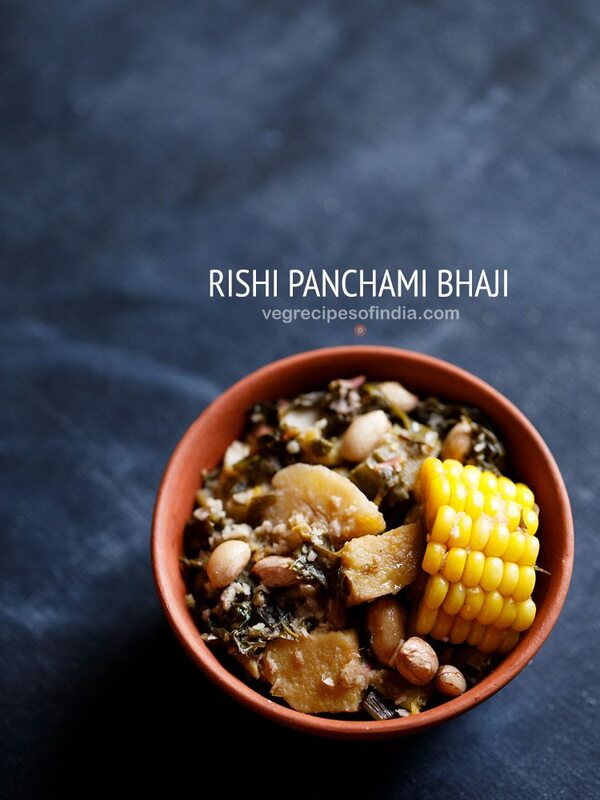 while serving garnish with coriander leaves. serve the kala vatana amti with steamed rice, rice pooris or rice bhakris as a naivdeya or bhog to lord ganesha. Hi Dassana! thank you for amazing recepies and inspiration for cooking! 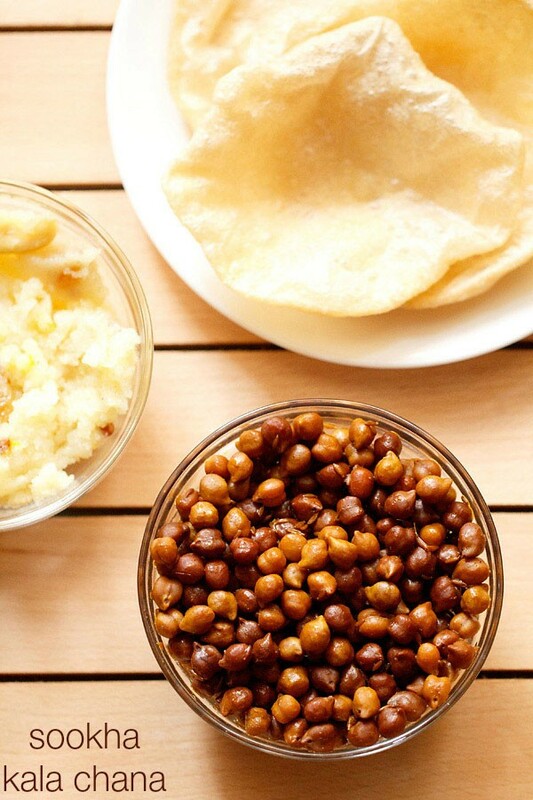 I like the combo of spices for masala here but can i substitute the black peas with mash? 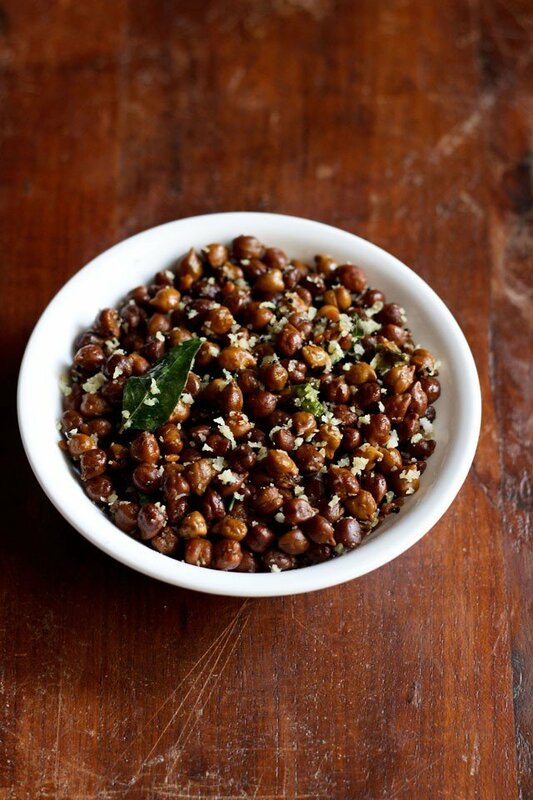 (i suppose you call it green moong) coz i ve never seen black peas in my place. and if so should i made some alterations in recipe? thank you! ksenia, firstly thank you. 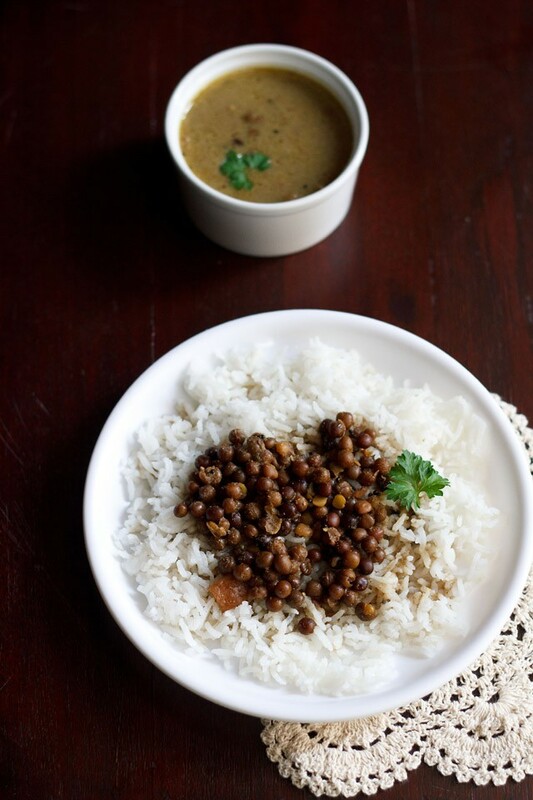 you can use moong beans, even dried green peas or white peas and black eyed beans. no need to make any change in the recipe. you can just add less or more water to the curry/gravy as per your preference. we are very pleased to know this ashwini 🙂 and thankyou so much for your kind and encouraging words. thanks again dk ji. recently on a trip to konkan, i got a good malvani masala. so will take time to add the recipe. but will try to add. thanks seema for letting me know. i have updated in the recipe instructions. You really brought back some memories. My grandmother would make this for us so often. One of my all time favorites! you will like this renu. the taste was similar to kadala curry. even with black chickpeas the amti would taste good.